Not sure which operator to book while travelling to new routes. Many operators getting added frequently, how to evaluate their services. Well to address the above customer concerns and to provide the ease of travelling comfort, we have implemented this unique realtime feature i.e. Smart Operator Ratings. These ratings not only speak the "Service Quality" of a particular operator but also enables the existing as well as New customers to choose those right operators who ensure travelling comfort without any issues. After customers complete their journey, immediately a feedback link will be shared on their email id for capturing feedback on last travel undertaken. The feedback thereby shared by our customers is collated and is displayed against the respective Travel Operators for immediate reference to other customers. This feedback also helps the Operators to understand specific issues and take action to address them for service improvability and customer retention. Passengers are able to access qualified, reliable and most trustable bus operator based on Smart Operators Rating. 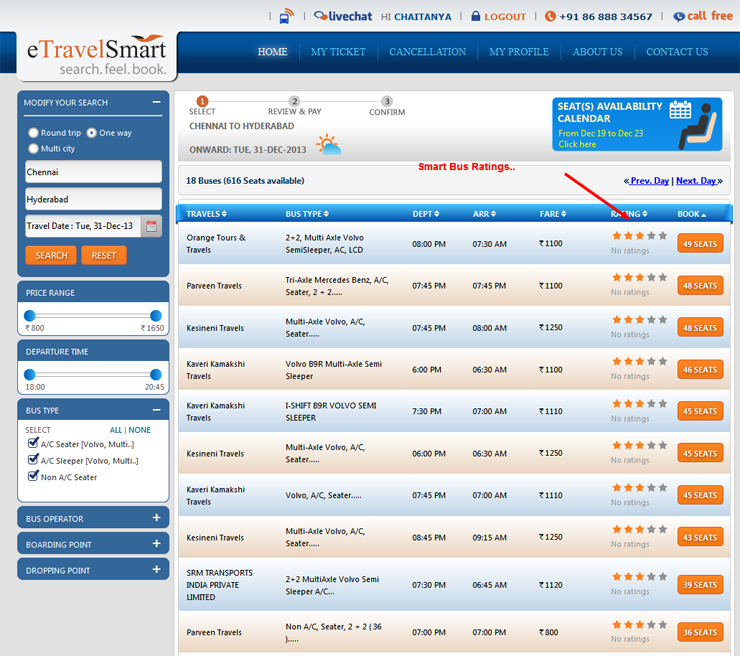 Passengers are able to choose best bus to travel based on Smart Ratings available on bus search layout.